As one of the three great Abrahamic faiths, Christianity has deep roots in the Middle East…writes Sean Savage/JNS. Yet today, the region is largely devoid of Christians, and the small and ancient communities that do remain face incredible hardship and persecution. Their plight has become more well-known in recent years due to the genocide carried out by the Islamic State terror group, which swept through large swathes of Iraq and Syria that were home to Christians and other religious minority groups. Despite the success of U.S.-led coalition forces against the Islamic State, Christians in the Middle East run the risk of “imminent extinction” due to the “threat of violence, murder, intimidation, prejudice and poverty,” the Archbishop of Canterbury recently warned. Amid their struggles, Middle East Christians and other religious minorities received a boost in recent weeks with the signing into law by U.S. President Donald Trump of the Iraq and Syria Genocide Relief and Accountability Act, which provides humanitarian relief to genocide victims in Iraq and Syria, and holds accountable Islamic State perpetrators of genocide. Pastor John Hagee, founder and chairman of Christians United for Israel, who has been outspoken on the need for the United States to do more to aid Middle East Christians, applauded the law. “My sincere hope is that through this bill, American assistance will aid those religious groups that suffered so horrendously under the Islamic State, and American and foreign authorities will go after those responsible for the horrors committed by the Islamic State,” he told JNS. “I don’t know that we can ever say that enough has been done to make up for what these people endured, but this is a good step by the Trump administration,” he added. Tricia Miller, a senior research analyst and Christian expert for CAMERA, told JNS that the new law will boost support for relief groups, including faith-based ones, who had been only relying on private donations until now. 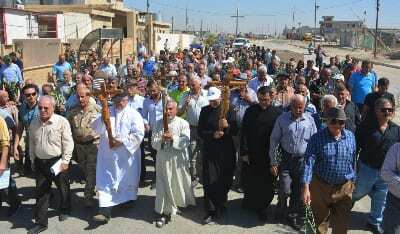 Despite the new law and recent success against the Islamic State, which has led to the liberation of many of the ancestral lands of the Christians in Iraq’s Nineveh Plains region, the damage done over the last several years has been significant to a community that has already been weakened by decades, or even centuries, of persecution. “The numbers of Christian families have been on a steady decline for over a century, but in the last two decades, the departure of Christians has been devastating. Iraq has lost over 75 percent of its Christian population. If current trends in Syria continue, there might be the same type of loss there,” Clancy told JNS. “The Christian population in Iraq has gone from 1.5 million in 2003 to just about 200,000 today, and the numbers in Syria are comparable, although more difficult to know exactly as a result of confusion in the context of war,” said Miller. Clancy noted that while some Christians have been returning to their villages and homes, there remains a sense of despair among the community, as well as a lack of opportunity, fear of future attacks and a sense of abandonment. Philos Project’s Nicholson said that the local attitudes, as well as political and legal rights of Christians in the region, need to change if they are to have any long-term prospects. “Christians are still viewed by most Muslims as second-class citizens, who are to be protected rather than respected. They need political rights, substantive equality, due process and fair representation,” he said. While Christians in Iraq are attempting to rebuild their lives after the Islamic State attacks, many still see radical Islam are the primary threat to the community. “From Tehran to Damascus and from Hezbollah to the Muslim Brotherhood, the greatest menace to Christians in the Middle East are the radicals in the region,” Hagee said. Nevertheless, he thinks that the United States should further work with its allies in the region, which in turn bolsters the support for Middle East Christians. “We have true allies in the region as well. Allies that share not just our interests, but more importantly, our values. The Israelis and the Kurds are our true allies in the region, and because of the tolerance exhibited by those allies, we help Middle East Christians by supporting Israel and the Kurds,” Hagee said. At the same time, Hagee expressed concern over the announced withdrawal of U.S. forces from Syria, which had been working and protecting minority groups in the area, including the Kurds, as well as providing a bulwark against Iranian expansionism and fighting the Islamic State. Although Christians living in Muslim majority countries in the region face a bleak future, the small Christian minority living in Israel has unparalleled rights and protections. Unlike other countries in the region, the population of Christians in Israel has actually been growing. According to the Israeli Central Bureau of Statistics, the Christian population stood at around 170,000 in 2017, up from 167,000 in 2016 and 133,00 in 2000. “Israel is the only country in the Middle East where the Christian community is thriving. Israeli Christians are equal citizens in every respect; they can hold any job, serve in government and the military, go to school and worship as they see fit. One of my most fervent prayers is that one day soon every country in the Middle East will approach minority rights, and frankly women’s rights as well, the way Israel does,” said Hagee. Nicholson echoed this sentiment but noted that the Israeli government needs to do more to continue to work with the community. Still, everything isn’t rosy in the Holy Land for Christians. In the disputed territories, especially in areas under Palestinian Authority control, Christians face pressure similar to elsewhere in the region. In Bethlehem, which is regarded by Christians as the birthplace of Jesus, there has been a sharp decline in the Christian population—a fact often ignored by Palestinian Authority leaders who seek to capitalize on the city’s religious history to rail against Israeli policies. 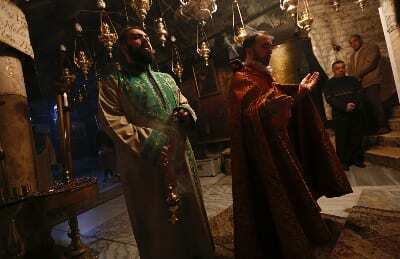 “In Bethlehem, the Christian population has declined from 85 per cent in 1947 to 46 per cent in 1967, and now it might be under 10 per cent. Christians leave because there is little opportunity for them, and their skills and education make life in the West very attractive,” Clancy said. Amid the holiday season, Hagee urged American Christians to keep the plight of their brethren in the Middle East not only in their prayers but also to continue to speak up for them. “My message is simple: Our brothers and sisters in Christ are being persecuted for their faith. We must pray for them, speak up for them and ensure our elected officials know that this issue is deeply important to people of faith across the country,” he said. The pastor added that Christians should also take a page from the Jewish people, and to remember and build on past tragedies regarding their religion. 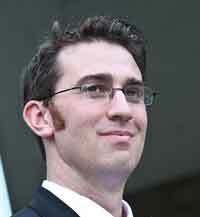 Coming from an evangelical perspective, one can’t argue with the good pastor but as far as “Christians should also take a page from the Jewish people, and to remember and build on past tragedies regarding their religion”…..
With due respect, I think this is where mis-guided ecumenism comes into play, with a certain amount of patronising.